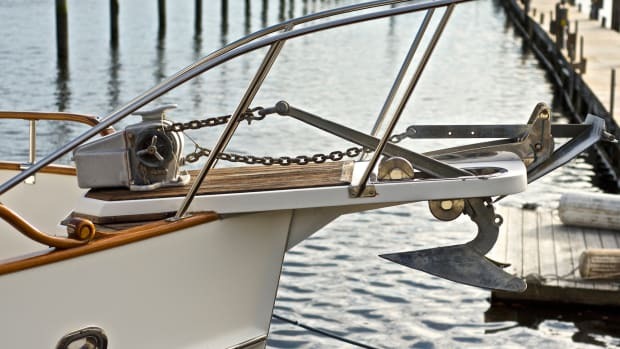 Few, if any, components aboard your vessel are as important as the running gear—that train of rotating parts between the propeller nuts and the transmission. While it hasn’t yet been perfected, the basic design is over a century old and few mysteries remain where its operation and reliability are concerned. Yet, I marvel when I see the same errors being committed over and over again by boatbuilders, boat yards, and other marine industry professionals, especially where anti-foulant application is concerned. The good news is these common mistakes can easily be avoided. Read on and you’ll see how you can avoid falling prey to these running gear faux pas. It should come as no surprise that a clean propeller, shaft, and rudder improve or maintain a vessel’s operating efficiency. Propeller blades are smooth and free of irregularities, at least when they are new, to ensure maximum thrust and transfer of energy from the engine to the water through which they turn. Just a few hard barnacles striking on a propeller or rudder blade can have a significant impact on fuel consumption, vessel performance, and in extreme cases, engine longevity. The drag created by this growth should not be underestimated. I’ve encountered noticeable performance degradation with three nickel-sized barnacles on the pressure face of a single propeller blade. Therefore, don’t underestimate the impact of this small but formidable foe. There are a handful of approaches you might take to keep marine fouling in check. Regrettably, conventional application of anti-fouling paint isn’t one of them. Because of the turbulence and abrasion that surrounds most running gear; it’s tough, if not impossible to get virtually any conventional anti-fouling paint to adhere to these surfaces for any length of time without special measures. 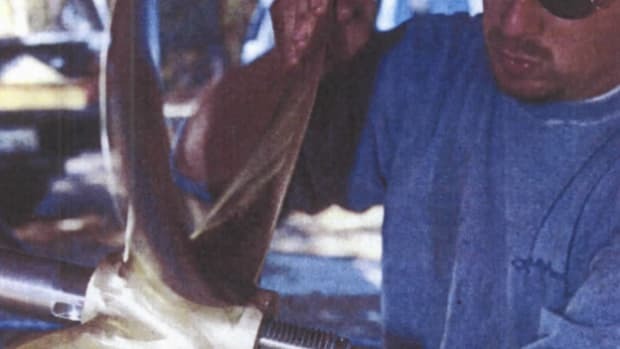 Applying anti-fouling paint to running gear without these measures is simply a waste of paint and labor, especially where propellers are concerned. However, with the right preparation and, in some cases, by using proprietary coatings, it’s possible to achieve a lasting anti-fouling coating on propellers, shafts, struts, and metallic rudders. Regardless of the type of paint or coating that is applied to any surface, preparation is a key element in ensuring its successful performance. It’s especially important on metallic running gear components because of the challenges they present for coating adhesion. In simple terms, the surface must be profiled; it must be slightly rough to afford any coating a toehold to which it can adhere. It’s important to remember that this “connection” between a coating and running gear’s surface is mechanical rather than chemical. Thus, the coating must have something to hang onto. If the surface is smooth or worse, polished, it’s nearly impossible to achieve this important mechanical bond. However, chemical bonds often play a role in the application of anti-foulants to running gear. In most cases, manufacturers of anti-foulants that are designed to be, or may be used on running gear specify a multi-step coating process that involves an initial coating, which achieves a mechanical bond with the running gear, followed by successive coatings which achieve a chemical bond with previously applied coatings. The successive applications of coatings, after the first, are often designed to chemically interact with previous layers, achieving an especially tenacious and highly desirable chemically interlinked grip with each other. However, for coatings to chemically interlink with each other, they must be applied before they fully cure. In most cases, this is a function of the passage of time and ambient temperature, (most coatings cure more rapidly when temperatures are higher). If too much time passes, especially in warm weather, the chemical application window may be missed. Herein lies the problem with most running gear anti-foulant applications. First, if the metallic surface of the propeller, rudder, strut, shaft, etc. is not properly profiled and thoroughly cleaned, with all contaminants such as wax, oil, grease, and anti-fouling paint removed, the coating will not last long. One of the most common surface “contaminants” is defunct anti-foulant. Remember, anti-fouling paint is designed to prevent anything from sticking to it. If you attempt to apply a coating over it, the coating will often release, leaving bare metal on which barnacles and other marine life can settle. Oil or other lubricants are detrimental to coating longevity as well. This may even include oil and sweat from human contact. Second, if successive coating layers are not applied within the manufacturer’s specified chemical application windows, they will fail to achieve the desired bond. Ultimately, they will separate, which in turn, can leave a surface ripe for establishment of marine growth. In my experience, the vast majority of running gear anti-fouling coating failures can be attributed to a failure to follow preparation or application instructions. However, in nearly as many cases, the frequent refrain from the user is, “That product doesn’t work. I tried it and I got barnacles anyway.” While strictly speaking, that statement may be true, and while he or she may not be the one responsible for the failure, it’s often at no fault of the coating manufacturer; instead, it’s a function of the applicator’s failure to follow instructions. Avoid falling into this trap by ensuring that you, or those applying anti-fouling coatings to your running gear, do so with strict adherence to all of the coating manufacturer’s instructions, and especially those related to surface preparation and chemical application windows.